The other day I posted the above picture and asked for guesses as to where it is located. Quite a few people were able to pinpoint where it is, but there were a lot of good guesses too. The area in the picture is located in Micky’s PhilharMagic. It’s the area where guests wait to go into the theater. 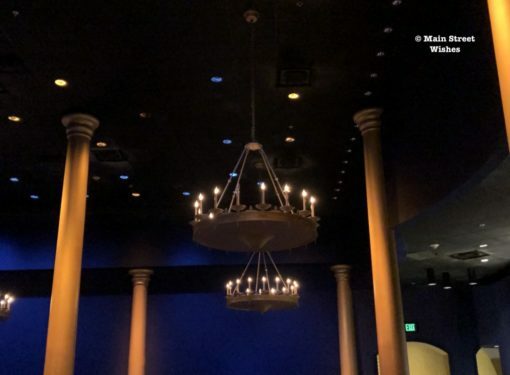 The high ceilings, big chandeliers, and color scheme in this area fit will with the rest of the Mickey’s PhilharMagic decor. There’s plenty of space in this area to for guests to wait by the theater doors. Once the doors open guest can enter the theater and choose a row. Guests are told to walk to the end of the row, not to stop in the middle of the row, to fill in all the seats, which is especially important when it’s busy. If you want to sit in the middle of the row, then let other people go in the row before you, that way you won’t be all the way at the end. Mickey’s PhilharMagic is a fun 3D show that follows Donald Duck after he steals Mickey’s sorcerer hat. While chasing the hat, Donald ends up in several classic Disney movies and meets some favorite Disney characters along the way. The 3D graphics are a fun part of this show and the music in it is from the different Disney movies, so they are classics that guests know. Thanks to everyone who played along this week and congratulations to those that knew where the area is located! We’ll play again next Wednesday! Have you been to Mickey’s PhilharMagic? I love Mickey’s Philharmagic! It’s a good place to go when you need a little rest in a nice cool theatre! Can’t wait to visit again soon! Just as an aside…. extend our trip to be able to enjoy all we love about Disney! Thanks!